I know it's late but after all the bad reviews I was never in a rush to see this and despite Johnny Depp's best efforts, I'm giving Public Enemies a bad review as well. 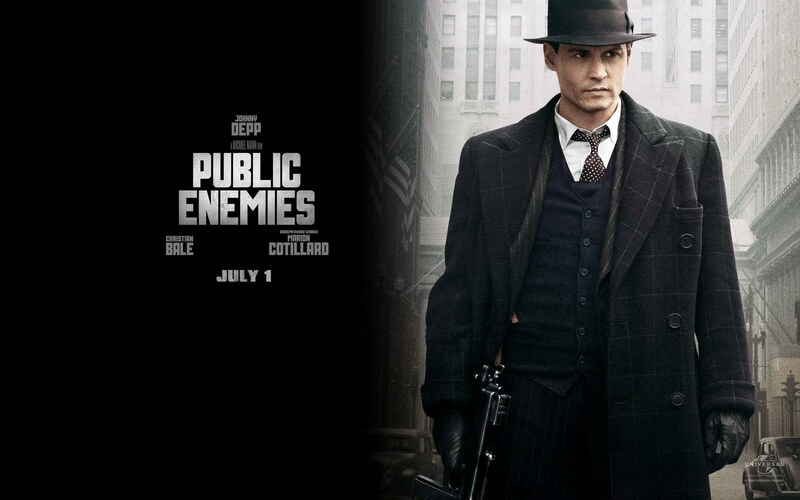 Back during the great depression in the 30's, John Dillinger (Depp) was America's most notorious bank robber and the most wanted. The crime wave of robberies by Dillinger and his associates brought along the birth of the FBI. The 143 minutes dedicated to this movie are based around Dillinger's final years as he is hunted by the FBI and agent Melvin Purvis (Bale). It also explores his romantic relationship with Billie Frechette (Cotillard). If I had to generalise I would probably say that this movie failed in almost every way possible. The biggest let down for me was the lack of actual bank robberies. Usually something you look for in a movie about a bank robber in the height of a crime wave. What there was of the robberies were executed with some brilliant camera work by Michael Mann and a great soundtrack with "10 Million Slaves" by Otis Taylor. Depp seems to be so cool that he could do anything but he didn't always look comfortable in his role. He never really owned it. The sexual chemistry between him and Cotillard just wasn't there and you didn't buy into the fact that he was on top of the world with all the money and infamy he reveled in. Nothing like the way Ray Liotta, Robert DeNiro and Joe Pesci did it in Goodfellas. Christian Bale didn't have a meaty role but he did quite well with what he was given. After Terminator: Salvation, I've been thinking he's a little overrated so I've lowered my expectations of him. The final nail in the coffin was the length. At 143 minutes, I often found my mind wandering. You had this feeling the movie could break out at any moment but you knew it wouldn't. If you're a Johnny Depp fan, it's ok to check it out, you won't hate yourself but otherwise forget it. This actually isn't the trailer, it's fan made with "Ten Million Slaves" by Otis Taylor dubbed over which features heavily in the movie and is a great track. I wanted to share that with you more than the original trailer!